It’s popular. It’s played at D’ Family Park in Talamban. In the hills of Consolacion. At the back of Tisoy’s Restaurant along A.S. Fortuna. Hundreds polish their rifles and pistols. Hearts pump fast. Bullets riddle the air. Men paint their faces. Women camouflage their bodies. 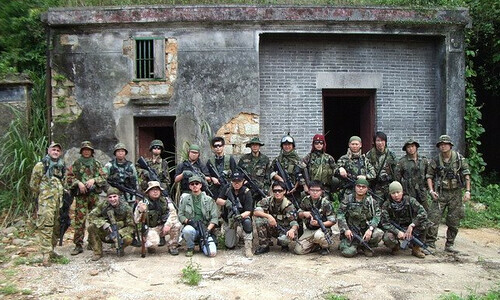 Airsoft is one very popular sport in Cebu. Yesterday, while working out in the gym, I watched the 6 p.m. news on TV and caught a glimpse of Cebu City Councilor Jack Jakosalem. He was talking about airsoft and an upcoming event at the Gaisano Bowlinplex Parking Lot. “Getting Hit Is Not An Option” is the name of the event. Nice name. The tournament organizers visited the every-Thursday SCOOP (Sports Communicators Organization of the Philippines-Cebu Chapter) forum at the Baseline Restaurant to announce the event which starts tomorrow (Saturday). hey um how old do u have to be to play airsoft i just got my gun and im 10 but i play paint ball in paintball village what is your rules get back to me ASAP. WOAH!! !